You could sprinkle the powder where they will walk through it (mix a little dirt with it first so it will blend in) and put a dab of the oil on their doorknob, all the while praying that they will get gone. Thank you catherineyronwode! I'm sorry for the multiple posts. I think I've got it figured out how to do this. I am very excited to say that I received my hotfoot kit and jinxing and uncrossing dressed candle. I'm embarrassed to ask if there's a video to teach me how to use this properly? I'm afraid to go in detail because I don't want to get kicked out of the forum but I have 9 needles and a photo. Is the photo supposed to go underneath the candle and am I supposed to hold the needle that's dressed in hotfoot oil to the flame? There's no video that I know if....sorry. Yes, pictures can go under candle. Are you talking abut needles with the petition paper? Please I'm wondering if Hot foot powder or oil can help stop someone from visiting a particular city. Will adding goofer dust and grave yard dirt help. I have access to hee shoes and can try going to where they live but it may be a bit difficult for me. I have access to her shoes because she visits me sometimes. Am basically looking for a way to stop her from visiting a particular city. Hi Miss Aida today was the first day of casting the hotfoot spell and I swear I put so much energy that my Native American and African American ancestors heard my plea! I ordered the fiery wall of protection and it should be arriving any day now. Do I start this after I complete the 9 days of hotfoot spell? Good job! That's the way to do it !!! You can start the protection immediately!! And please help me out. One way you could work with a map in this type of work would be to print out a map of the city (one that shows the city as just a dot on a large map), and then lay down a ring of Hot Foot powder all the way around that city on the map. As you sprinkle the pinches of powder, being saying something like, "So & So, you stay out of this city. You are blocked from ever entering this city." Thank you Sister Jean. I have a good visual of this. Thanks again. Do I have to wait for the waning moon to prepare a freeze spell? My tenants have filed an emergency hearing for Monday to stop the eviction for one of the tenants. When there's an emergency, negate the moon phase. just do it!! I am very excited to say that after doing the hotfoot spell (from a distance), the fiery wall of protection, and freezing spell at midnight ALL unruly tenants must vacate my property. I will be flying down from NY to go in with the sheriffs to change the locks. Is there anything I should do once I am in the house? I remember my grandmother used to take a glass of water and say a spell while throwing the water outside the front door. Should I do the same? I only bought the hotfoot kit, Fiery Wall of Protection and uncrossing, jinx candle. I wished that I spent more time reading everything thoroughly but this was an emergency situation. I had to chuckle about your grandmother. That is also a Santeria spell that my family used to do with the water. Only, they would let it sit for a while to absorb the negative energies before throwing it out. Protection spells would be good. Thank you Miss Aida! My grandmother was always doing protection spells and I understand why she did them now. After watching my tenants trying to resist being evicted by the sheriff's I decided to do another Fiery Wall of Protection spell. Is it ok to prepare everything and do the spell the next day or do I have to start the spell once I'm finished dressing the candles and such? Yes it's OK to prepare your spell in advance of starting it. In fact, this is generally good advice, to make sure you have everything in order and don't forget anything. I'm glad these people are gone and I hope you replace them with responsible, drama-free tenants! Miss Athena thank you so much! After assessing all the damages and flea infestation I think I'm going to do away with renting it out. It's so sad that I have to let go of my grandmother's home but I don't want to experience this again. Oh that is a pity! I'm sorry to hear it. If you plan to sell the property, then work with St Joseph. The spell kit is wonderful. Bury the statue upside down in the front yard until the home is sold, then dig it up and keep it in your home to give thanks to for his assistance. I wish you much luck. Please keep us posted. Here's what has been going on my landlord moved in a new roommate about 6 months ago and he only showers about once every 2 months and doesn't wash his hands after going number 2...ever (my room is next to the bathroom and I hear everything). I called our landlord about his not showering (because he stinks really bad to where I almost puked) and she forced him to shower but then he started spreading rumors that I was just trying to get him kicked out for having called her and told her but anyway that is when I started using GTFO oil first on the inside of his pillow with the proper procedures and then on his door knob a total of 4 times over the past 2 months with little to no result's my hopes did go up when I heard his cousin say that they are thinking of putting him in a care home (because he has really bad epilepsy and goes into seizures quite often) but he told her that he would run away if they did and I haven't heard anything else about that move since then which was probably 2 weeks ago. Is his will to stay here and stink up the place and spread bacteria and feces (thus placing us all in harms way) more powerful than the GTFO oil because like I said I've done it 4 times the last 2 months and it doesn't look like he is going anywhere with just a hint of he might be and with him throwing a tantrum over it in return? Should I try something else...is the powder more effective than the oil maybe I could try that instead? Maybe there is a more effective oil or powder than hotfoot? Please I have an inlaw who wants to visit from London to USA, I have tried to let this person know I'm not accepting the visit but he is insisting, saying it's for the kids, but this visit is more than that. So please is there a way to stop him from visiting, Maybe for him to change his mind. I don't have his personal concern but can find his picture. Thank you all. Much appreciated. 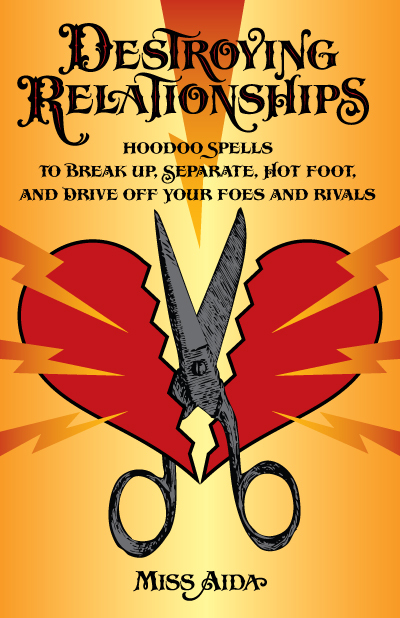 Since you are on the Hot Foot thread, have you tried the Hot Foot candle spell? I thought it's the right forum. No I have not tried hot foot. Where do I get the hotfoot powder to remove BAD Tennants?? Can this be done remotely? 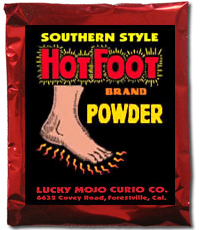 Hit Foot Powder is a form of folk magic called contact magic. It cannot be done remotely -- people are intended to step in it to be forced to move. I would like to know if there is a powder with which you can drive away neighbors forever? Goofer Dust has shown no effect, is there anything stronger to destroy the neighbor totally? I hope you are in good spirits. I'm getting ready to order the Hot Foot & Run Devil Run oils and powder to get rid of a bad neighbor (or at least set boundaries with him). In a nutshell, I've had ten years of issues with this guy -- from trying to get a restraining order against him in the early days so I could go outside and work in my yard without being threatened to the present time of his sugar mama suing me because the property line is in her driveway. (Her PoPo buddies insisted I had to get a survey 'cause they couldn't arrest Jason for trespassing without it.) There is one area of my yard that he walks on constantly every couple days. It's also an area that my yard guy mows. If I put the powder/oils in that area, will it also drive away my yard guy? He uses a riding mower, so he doesn't actually set foot on that area, but you never know! There's always that one time he may have to walk on it to remove branches or something. If you call your target's name when you sprinkle the powders and say they are for HIM and him ONLY, they won't affect anyone else. Not your yard guy, nobody. Hi all, can someone give me advice on how to make a roommate “MOVE OUT” but without incorporating the use of hot foot? Something more gentle? I have heard of banishing but I don’t want to “banish” them from my life, he’s a good friend and I have known him over 5 years.. I just want him to move out somehow. Even if it means he goes back to his original city to stay with family.. sorry if this sounds selfish but it’s really altering my life at this point .. what can I do to gently get him to move out? You can use separation products is used to break people up without the fighting. Also you can use a honey jar to sweeten him back to his home, or a moving candle spell to move him back to his family's home. But why does the package say “confusion quarrel divorce”? I don’t want any fighting at all.. no ill feelings.. I don’t want to damage our friendship.. I just want him to leave peacefully. I don’t understand how a honey jar would be suitable in this situation as either? Can you explain how to sweeten someone to a place/his home? Separation is used to break up without the blow up that is common with break up products which causes fighting, anger, hitting, etc. You want to separate him from your home, use the petition. You can also use a moving candle to move his candle to a photo of his home or move it across a map over a week and have it stop and finally burn out on his home location. hmm i guess i will try the separation products maybe sachet powders.. or vigils lit by misc..
unfortunately, i am afraid he will see me doing the moving candle spell or the honey jar.. the honey jar spell (w the map and dirt) on the house blessing page sounds lovely but again, i don't want him to see me doing anything.. and with him having no job.. and its a new city so no friends.. he is ALWAYS here. Have lucky mojo light an Attraction or House Blessing candle for you to draw him to his home. Iclude the address if you know it, or specific name of the city. Since the topic of this thread is "Hot Foot Evict Move Out Roommates Tenants Guests Neighbors" that's about as far as we can take the conversation off-topic. So the tenant in my mother's house is not leaving. The court decided they had to leave but they have lodged an application for the court to reconsider again. The tenant has not paid any rent for a few months. The next court date is in 2 months time. I think a hot foot spell is needed or an ammonia jar. Is hot foot oil and powder the best to use? I dont have access to the property as I live far so I can only do candle work. The petition will read "[name] moves out of [address] quickly without further delay or damage to the property. Is this a good petition or should I put the date by which the tenant needs to leave eg: without further delay before x/x/x or should I leave it open for the universe to decide? See paragraph 7 for the start of the candle spell and paragraph 11 for the start of the name paper. You don't have to specify a date but can if you like, your first wording is fine. You can compare yours with the examples given on the page above. I'm sorry I posted this mistakenly on another thread, please read my story and help me with some advice. Happy new year LM family. Please I need helpful advice here. I am trying to downgrade from 3 bedrooms to 2 bedrooms apt, within the same complex. I found one, saw it, liked it and drove out to go get money order and also picked my kiddos from school, but by the time I got back someone else showed up with a check and they rented the spot to them. I am not happy about this outcome. I feel it's unfair what they did. Please is there anything I can do asap to stop this family from moving in to this place. I moved your other post to the correct thread in the forum. Search your posts from your profile page and you will find it plus my response. Go to your profile page and click the link on the right side under "User Statistics" where it says "search user's posts" and all of your posts will appear. Click on the one you are searching for and it will direct you to that post, where you can see my reply to you. That should solve the mystery.